MI 49098 – Breakfast provided. Browse/Shop the Lane Automotive performance parts showroom. Kick Off Cruise & Convoy from Lane Automotive Inc./Motor State Distributing – 8300 Lane Dr, Watervliet, MI 49098 to Jeep Invasion. Go Wheelin’ and enjoy the dunes! 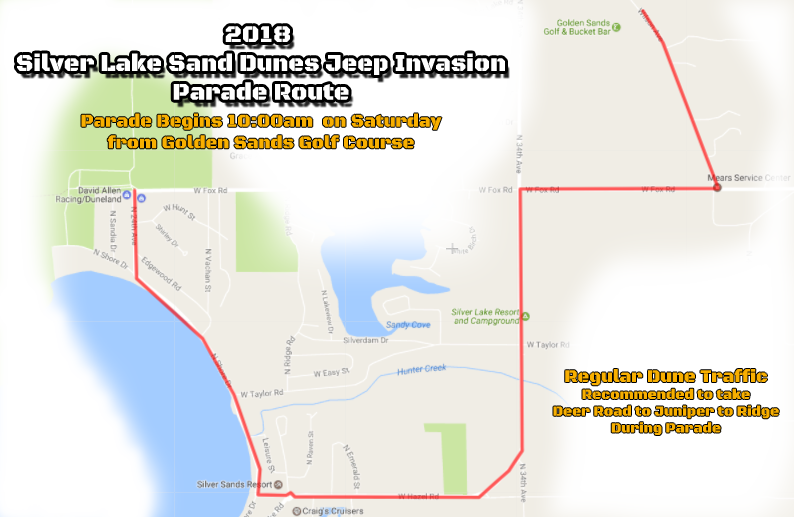 We would like to thank all those that came out and spent their weekend with us for a very successful 2nd Annual Silver Lake Sand Dunes Jeep Invasion this past year. A very big thank you to everyone involved with this year's Jeep Invasion, from the committee, the endless hours the volunteers​ put in, our sponsors and vendors! The Hart Fire Dept, Oceana County Sheriff Department and the Silver Lake State Park DNR! And most importantly our huge Jeep/Dune Family! Mark your calendars for June 1-3, 2018! The countdown has begun - check back for more info in the coming weeks. SLSD Jeep Invasion is at Golden Sands Golf & Bucket Bar. Country Dairy, IncWe are so excited to be a part of this event! A parade on sunday?? Guess we are out! Campers pack up and leave sunday! Lonnie Fitch you think we could do this? Serafina Romano or there’s this one ?